Captain America is the all American spirit rolled into one big hulky man. 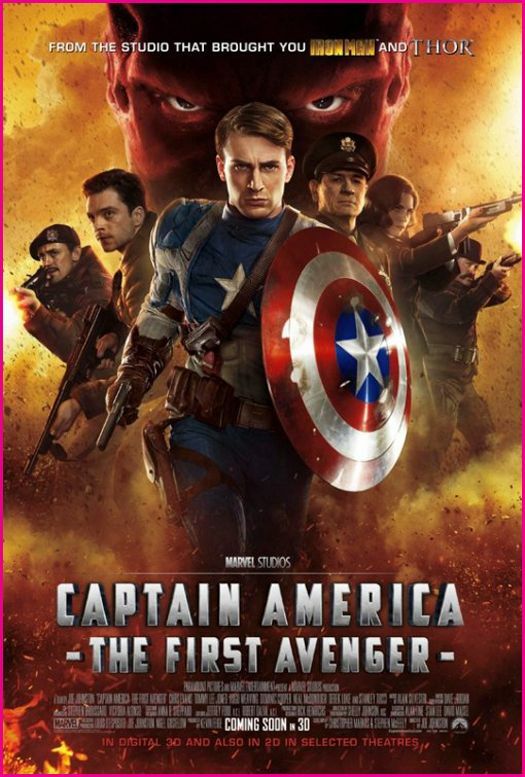 Captain America: The First Avenger is a film about one little man’s dream of being in the army in the early 1940s in America to fight against the Nazis. He tries many times to get in but with a different name each time and on the last try he is spotted by a man from the secret Project Rebirth. This man, Dr. Erksine, fulfils his dreams by recruiting him for the Project. But what will the doctor do with him next? I went to see it in 3D which is becoming a regular bonus feature of nearly every film that comes out; I must say some are doing good job of it but some are not. I personally think that the 3D effect was not used enough and not to its full potiental. For instance, there were a lot of explosions in the film and they didn’t take the 3D opportunity of having bits of rubble flying out of the screen at the audience, which would have made it much more effective. There were loads of other opportunities to use the 3D but they didn’t, which was disappointing. My favourite character was Peggy Carter because she was a hard and tough women that was not afraid to take a punch but also had a soft and gentle side. I think what made me like her so much is because she is the type of woman that all women want to be. I liked the concept that Steve was weak because it gives the film a moral, which is that no matter what size you are, you can always fight for what you believe in. The film has the great combination of war and superheroes, how they mix together well to fight off evil, but also how superheroes can be used to increase evil and how the supernatural can create supoerheroes. There are a lot of elements of science fiction in the film, for example the enemy and its innovative weapons, which makes it a film for not just comic fans but also sci-fi fans. Captain America was originally a comic book hero who appeared in the 1940s.